You must be a member of the The Hague Culture, Creative and Culinary Group to attend this activity. Would you like to join this group? 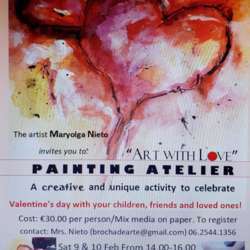 I would like to to invite all of you for an Art Painting Workshop of one the best Artist in The Hague MaryOlga Nieto. A Pre-Valentine's Day on Saturday February 9 & 10 of February at 14. Protected content . You can attend the next day 10 February the same time. Register now and make "Art with Love". A nice surprise activity to share with a loved ones or just for you to celebrate Valentine's day! Fee per person: €30. Protected content class with all materials included).